A summer party is quite a simple concoction at heart. Comprised of one part summer weather and one part family and friends, this magical mixture results in a truly wonderful creation ? good, old-fashioned fun. Of course, sometimes a summer shindig transforms from a little get-together into a big event propelled by popular demand. Just look at The Gathering at Chaffee?s. A summer party is quite a simple concoction at heart. Comprised of one part summer weather and one part family and friends, this magical mixture results in a truly wonderful creation – good, old-fashioned fun. Of course, sometimes a summer shindig transforms from a little get-together into a big event propelled by popular demand. Just look at The Gathering at Chaffee's. "We always called it a backyard party," said Doug Chaffee, the man behind the revelry. "The party just evolved into different things over different years because of different people, and it got its name back in 1998 because of a shirt." The Gathering at Chaffee's, a two-day, two-night music festival located in Girard that will kick start its 32nd celebration Friday, July 27, has changed quite a bit over the years. The event began on Independence Day back in 1980, when Chaffee worked for the Kahkwa Club. Chaffee and his friends held the bash to coincide with the club's fireworks show, starting a tradition that has lasted over three decades. Eventually, more friends and family started joining in on the festivities, and The Gathering grew. Live music made its first appearance at the celebration around 1991, leading to more and more attendees, including a fervent fan base. "I've had so many people come up to me and say, 'Well, we're going to show up and camp anyway, even if you don't have it,'" Chaffee said. "People have gotten so attached to it over the years." With the number of partygoers and costs from supplying these groups with food and drink rising, Chaffee switched the then-Chaffee Gathering into a two-day camping musical festival with vendors and live musical acts, with this year's lineup including Hot Buttered Rum, Giant Panda Guerilla Dub Squad, and several local and regional favorites. With the help of friends, family, and friendly fans, The Gathering has managed to keep the original "backyard party" roots, even with the constant growth, which continues into the upcoming get-together. "I always have trouble calling it a music fest, because it was always created around a backyard party," Chaffee said. "That's still the kind of feel it has; it's a big huge party with friends and family and people who have known each other for years. Year by year, it has evolved into something different. This year we decided to go all out, and the crooked i got involved with promoting and helping me out because Marty [Schwab] and Tracy [Evans] have come out and have seen what a wonderful thing it was and what a hometown touch it has and how family-oriented it was." Despite having helped foster this laid-back environment, Chaffee doesn't profit off of the event, instead he uses the proceeds to fund The Gathering, as well as donate to both the Juvenile Diabetes Research Foundation and The Children's Advocacy Center of Erie County. "Any money we make from food vending or merchandise vending – I don't make any money off of that," Chaffee said. "All that stuff goes to the charities, and I've always been big on that. I'm not here to make money. I'm here to help people have fun." While it continues to grow each year, The Gathering remains rooted in the backyard spirit. With just a single ticket, you've invited yourself to a weekend of music, companions, and, most importantly, fun. 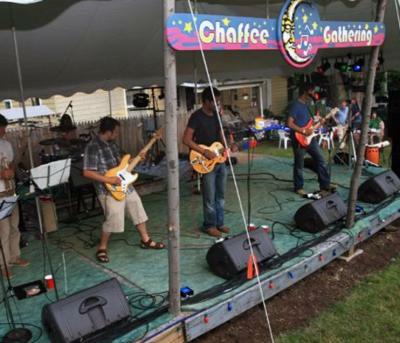 The Gathering at Chaffee's will take place at 8296 Mill St., Girard. For more information, including how to purchase tickets, visit: TheGatheringAtChaffees.com.